Titan is a 60Watt Bluetooth speaker with a really sleek industrial, but modern style. Utopia uses a special concrete, which is a 10 times stronger material than an average cement based concrete. It provides an outstanding low resonance enclosure to ensure zero sound distortion. The concrete is mixed with different pigments, minerals and sometimes marble and basalt. This process gives the surface of each speaker its own unique texture and grain. Each one is made by hand in Budapest, Hungary, one by one, ensuring that no two Titans ever look alike. Titan can be used wirelessly using Bluetooth aptX, or you can plug into the device with a 3.5 mm jack. The speaker features two 75 mm full range drivers and a rear bass-reflex port. There’s no mention of how much the speaker weighs, but its size is approximately 12” W x 6” H x 6.5” D. A nice minimalistic design that is perfect for the home or office. According to Utopia’s Facebook page, the official Indiegogo launch is August 4th. 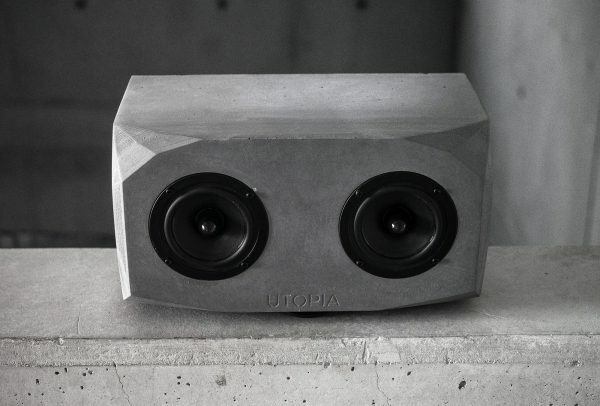 No pricing is available yet, however, if you want a chance to buy the speaker at 50% off head over to Utopia’s website and sign up for their newsletter. To learn more about the Utopia team and their products head over to their site or Facebook page. Unanimously voted as “Worst product of 2017” By FedEx, UPS, and USPS.